The lead project "Methane from Renewable Sources in Mobile and Stationary Applications" (MethQuest) launched on September 14, 2018 is aimed at developing environmentally compatible, affordable, and feasible approaches to a successful energy transition. The project is funded with EUR 19 million by the Federal Ministry for Economic Affairs and Energy (BMWi). Responsibility for joint project coordination has been assigned to Rolls-Royce Power Systems and the DVGW Research Centre at the Engler-Bunte Institute of Karlsruhe Institute of Technology (KIT). KIT researchers participate in two of the six joint projects. 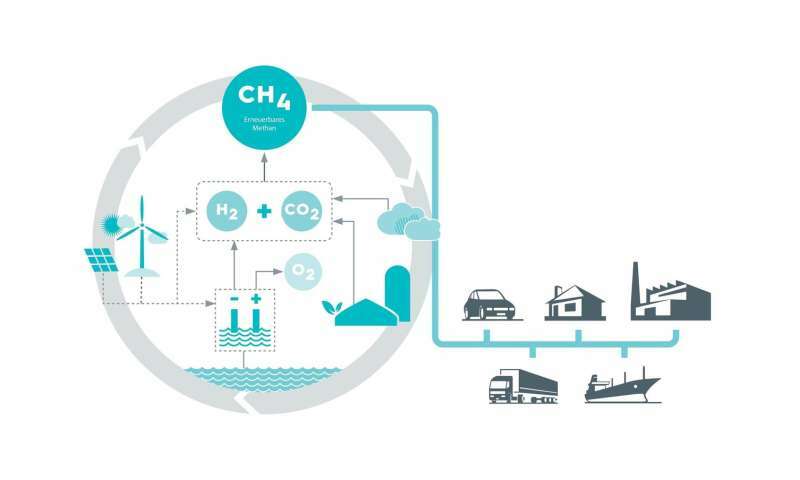 Within the MethQuest lead project, technologies are to be developed and analyzed that will enable methane-based fuels from renewables to be used in mobile and stationary applications and subsequently launched on the market. While the use of gas is widespread, particularly for heating purposes, its potential for passenger, freight, and maritime transport has hardly been developed to date. "For a successful energy transition, it is absolutely essential that the energy and transport sectors are coupled and looked at as a whole. At the same time, methane-based fuels produced using electric power that is generated from renewable energy sources (power-to-gas) will be an important factor. They will enable greenhouse gas emissions to be significantly reduced, which will help to achieve our climate protection goals. Further development of technologies for the energy-efficient use of these fuels is an integral part of the MethQuest lead project," said Norbert Brackmann, the federal government's coordinator for the maritime industry when the project was launched officially. MethQuest pursues a sector-overlapping approach. "The six joint projects will push innovation in a number of areas ranging from the development of novel solutions to produce gas from renewable energy sources to novel engine concepts for private cars, to stationary applications and ship drives, to the design of microgrids for both inland and seaports," says Dr. Frank Graf, Head of the Gas Technology Division of the DVGW Research Centre at KIT's Engler-Bunte Institute. Together with Andreas Schell, CEO of Rolls-Royce Power Systems, he accepted the official funding notification on behalf of the 27 partners from industry and research. The project has a total value of EUR 32 million. Total funding by the Federal Ministry for Economic Affairs and Energy amounts to EUR 19 million. The partners will collaborate in six joint projects ranging from methane recovery to new engine concepts for ships, to cogeneration plants and cars, to sector coupling using microgrid solutions for both inland and seaports, to systems analysis assessment. Among the partners of the MethFuel joint project that focuses on novel process technologies for the supply of hydrogen and carbon dioxide and for catalytic methanation are the Chemical Technology Group of the Institute for Chemical Technology and Polymer Chemistry (ITCP) and the Fuel Chemistry and Technology Group of the Engler-Bunte Institute (EBI ceb) as well as the KIT-associated European Institute for Energy Research (EIfER). In their joint laboratory ENERMAT (ENERgy MATerials), ITCP and EIfER will study how the components of power-to-gas plants run with power from renewable energy sources cope with strongly fluctuating power supply. Particular attention will be paid to the optimal use of solid electrolysis cells under the highly dynamic conditions of power-to-gas applications. In addition, EBI ceb will study three-phase methanation (3PM) that rapidly reacts to power fluctuations. This enables direct coupling of methanation to hydrogen production without interim storage and, hence, significant reduction of investment and operation costs. The Combustion Technology Group of the Engler-Bunte Institute (EBI vbt) participates in the MethCar project that covers the development of novel gas engines for cars. In a specifically adapted car engine, the special properties of compressed methane produced from renewable sources are expected to result in a very high efficiency. Moreover, methane engines are associated with much smaller particle emissions than diesel and gasoline engines. However, sizes of the particles produced are smaller than 100 nm in diameter. To prevent formation of these particles under certain operation conditions, processes are modeled and described by EBI vbt. This will help to reliably exclude particle formation in subsequent MethCar combustion process design and engine calibration. The other joint projects will be MethPower, MethMare, MethGrid, and MethSys. MethPower will cover novel engine concepts for stationary applications. MethMare will focus on two concepts for dynamically operable high-speed gas engines for ships. MethGrid will concentrate on solutions on the production, grid, and consumption sides for the design of microgrids for inland and seaports. MethSys will cover systems analyses of the costs, impact on climate, and feasibility of the new technologies. In so-called power-to-gas processes using electric power from renewable energy sources, environmentally friendly gas can be generated and stored easily for later use as and when required. Methane from power-to-gas processes offers numerous benefits compared to other power-to-X options, production processes are less complex and reach far higher levels of efficiency. This has a positive impact on production costs. Moreover, fossil natural gas can be replaced easily and successively by compressed or liquid methane from renewable energy sources. Existing gas networks and applications can still be used without the need for expensive and time-consuming modifications. Firstly, gas-based technologies are well developed and used in millions of applications. Secondly, there is an extensive and high-capacity infrastructure of existing natural gas networks and storage facilities available, with which fluctuations in the supply of renewable energies can be compensated, large amounts of energy stored, and energy consumption peaks balanced. Vehicles powered with gases from renewables, as a supplement to e-mobility, can make a major contribution to the energy transition.